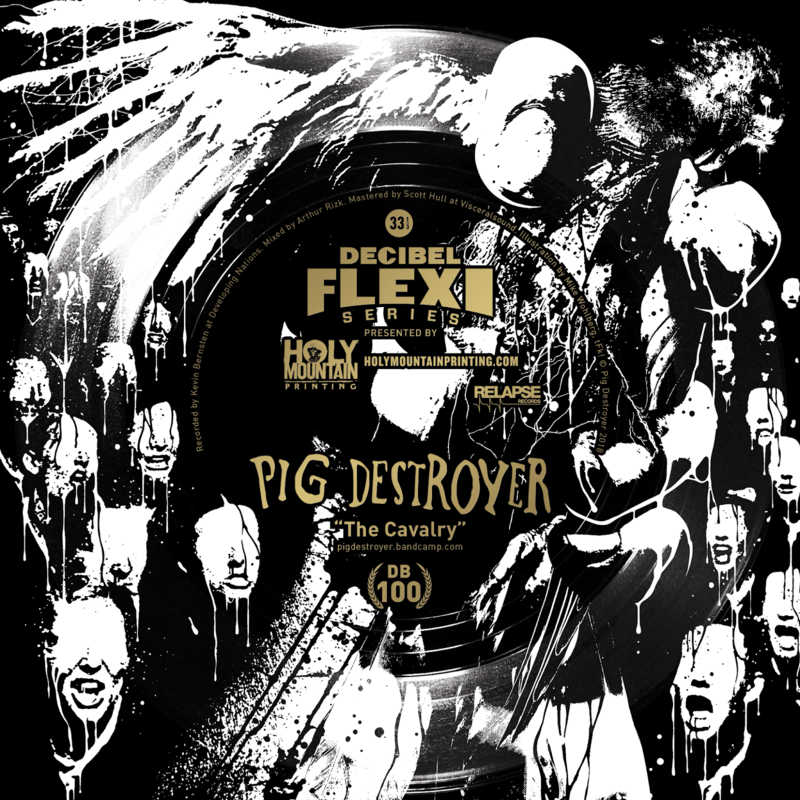 PIG DESTROYER will release a new song titled "The Cavalry" as part of Decibel Magazine's flexi disc series. "The Cavalry" will be the 100th flexi in the exclusive series. The flexi will be available to active Deluxe Decibel subscribers who purchase before February 1, 2019. Subscriptions are available via Decibel. Stay tuned for more information and a stream of "The Cavalry" in early 2019. Additionally, Relapse will be doing a limited t-shirt design to coincide with the release of the song. Lead guitarist Scott Hull said, "The music for "The Cavalry" was written as an explicit tribute to Jesse Pintado during the month of August 2018, specifically after listening to Harmony Corruption and World Downfall on repeat. We are proud to give this track to our hermanos over at Decibel and finally contribute to the Flexi Series as the 100th entry." Decibel's Editor in Chief Albert Mudrian said, "This flexi disc is literally 11 years in the making. Back in 2007, as we were putting together Pig Destroyer's first Decibel cover story, Scott told me how cool it would be to include a PxDx flexi disc in the issue. Great idea, only one problem: no one on earth was producing flexi discs in 2007. It would be another three years until those presses started rolling again and the Decibel Flexi Series came to life. When that occurred, I mentioned to Scott we should look into have Pig Destroyer record a track for the series. Lineup turmoil, conflicting schedules and various other hurdles prevented us from consummating a PxDx recording for the next several years. Then, sometime in early 2017, I realized it had been a decade since Scott conceived the idea. What's more, we were about 15 months away from 100th release in the Decibel Flexi Series. He and I agreed that a little over a year should be enough time to get it done, so a late November 2018 deadline was set for a master, and, miraculous, DB100 is a reality in the form of 'The Cavalry.'" Frontman J.R. Hayes said, "This song is about being disillusioned and desensitized in modern America. The aftermath of 24/7 negativity and paranoia. I want to thank Decibel for this opportunity and I hope all the fans out there dig the new song."